A routine part of a SERVPRO Franchise Professional’s service is inspecting the heating, ventilation and air conditioning unit (HVAC). Keeping the HVAC system and ductwork clean can potentially extend the life span of the equipment by allowing it to operate at peak condition, which may save you money. Unlike the majority of duct cleaning services, your SERVPRO Franchise Professional uses a Portable Ventilation and Air Duct Cleaning System to examine ductwork and make a clean sweep, removing years of dust and grime. SERVPRO Franchise Professionals will inspect your HVAC system and ductwork and make recommendations about the best way to address any indoor air quality concerns. This inspection can save you money and provide peace of mind on the health of your HVAC system and ductwork. In some circumstances, such as after a fire, smoke or suspected mold growth, duct cleaning becomes an essential part of the cleanup process. In these cases, your SERVPRO Franchise Professional can often restore the HVAC system and ductwork to pre-damage condition. Do you need Commercial or Residential Demolition? Here at SERVPRO, no job is too big or too small. We do any water, fire or mold job and whatever else comes along with it. If it requires a little extra work, we are happy to get the job done! Our SERVPRO team offers demolition work if needed to your mitigation or fire job. Many of our customers don’t know that we offer these services. After demolition is done, we also offer post construction work and final cleaning. Once the floors are down and the drywall is up, it’s time to remove the debris and dirt to lay carpet, paint and decorate. SERVPRO Franchise Professionals can provide the debris removal services to prepare the building for interior design. During the construction phase, a building can trap moisture. Excessive moisture could result in mold growth. If you think one of your projects mat have a moisture issue, rely on SERVPRO Franchise Professionals to provide the help you need eliminating moisture and preventing the potential for mold growth. Our marketers love to network! Our Marketing Representatives, Renae and Kate, love to market and network! There are many positive aspects about networking and meeting people at events. They just went to a Women in Construction lunch yesterday and met a ton of new people! This is great for SERVPRO because the construction department is growing more and more every day! The more people you meet, the more likely it is that they will remember you when they are experiencing a disaster! You never know who you might meet that may become a new client. When disaster strikes, it is never scheduled. Not only is it beneficial when we meet potential clients, but it might work in our marketers favor as well! It is always good to meet new people and potentially expand your business! We are Hosting C.E. Classes! On April 18th, our SERVPRO franchise is hosting Continued Education courses! We are offering an Ethics course and a Mitigation course. The Ethics class is from 1-4 P.M. and registration will be from 12-1 P.M. that day. The Mitigation Class will be from 10 A.M.- 12 P.M. Registration for the Mitigation Class is from 9-10 A.M. Both classes are located at our SERVPRO location! We are now located at 731 Red Mile Road. Lexington, KY 40504. For any questions, please call our marketers! SERVPRO helping out the Wildcats! Last year, at the Wildcats game against the Georgia Bulldogs on January 31st at Rupp Arena, several of our players were unable to play due to sickness. 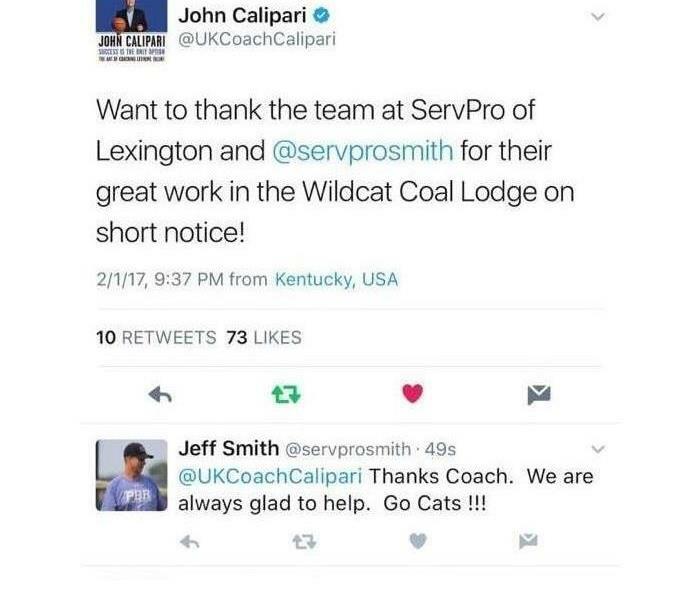 We got the call from the department of athletics that the University of Kentucky basketball Head Coach John Calipari wanted SERVPRO to come in and clean and sanitize the Wildcat Coal Lodge where all the players live to help prevent the sickness from spreading. How could we say no to our University of Kentucky Wildcats? We went in the next day and cleaned and sanitized all of the affected areas. SERVPRO always does whatever is necessary to get the job done. We even got a personal shoutout from Coach Cal himself! It always nice to help out our local team. GO CATS!!! A few weeks ago, the entire east coast was hit with a massive cold front. The eastern part of the United States didn't just feel the below freezing temperatures, but almost the entire area experienced a massive snow fall. Even areas in the southern part of the country experienced a large amount of snow. In Kentucky, we had a little snow. However, SERVPRO received a great deal of frozen pipes and water loss. 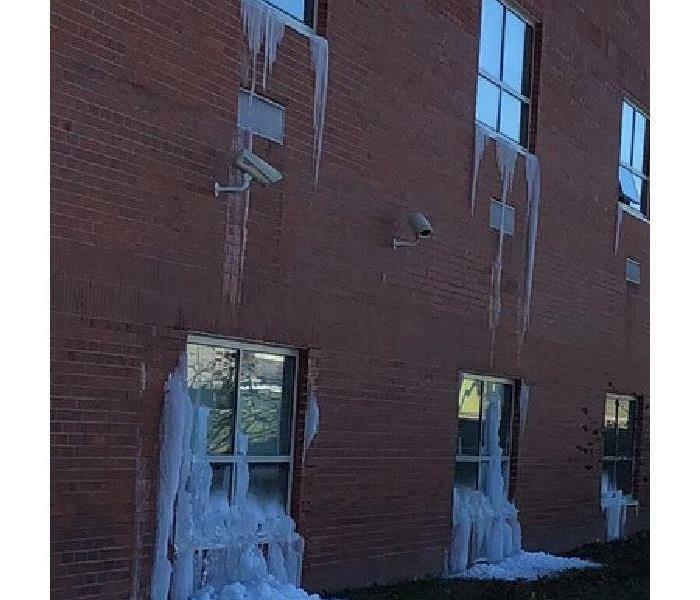 In this picture, it shows the water loss in this building from frozen pipes. This was a large commercial building with quite a bit of area affected. Typically, when pipes freeze, they warm up within a few days. When the warming process starts, the pipes begin to burst. After that, the building typically suffers a large water loss. There are ways to lower the chances of a burst pipes. However, the cold weather hit the area so quickly, most of the properties affected could not take preventative measures. 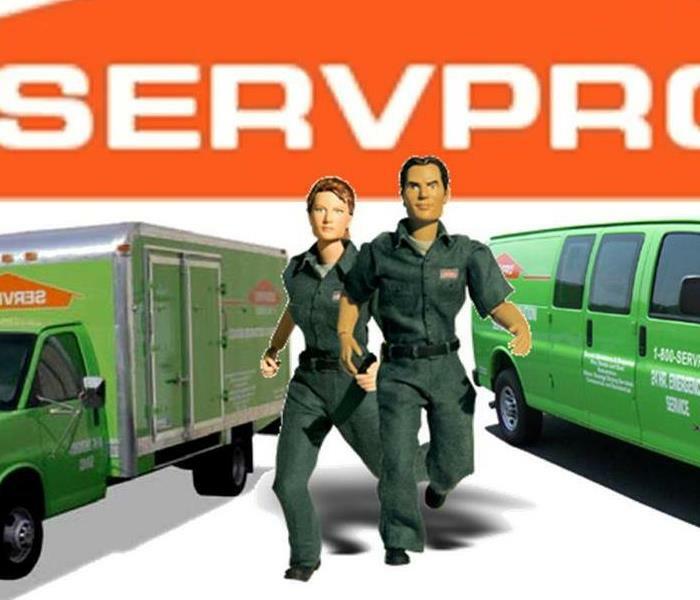 SERVPRO of Lexington, KY provides 24-hour emergency service and is dedicated to being faster to any-sized disaster. We can respond immediately to your emergency and have the expertise to handle your restoration or cleaning needs. There's never a convenient time for fire or Water damage to strike your commercial property. Every hour spent cleaning up is an hour of lost revenue and productivity. So when the need arises for professional cleaning or emergency restoration services we have the training and expertise to respond promptly with highly trained technicians to get your property back to business. When Storms or Floods hit, SERVPRO is here! SERVPRO of Lexington specializes in storm and flood damage restoration. Our crews are highly trained and we use specialized equipment to restore your property to its pre-storm condition. When storms hit, we can scale our resources to handle a large storm or flooding disaster. We have traveled to many areas of the country to help those affected by storm damage. We can access equipment and personnel from a network of 1,650 Franchises across the country and elite Disaster Recovery Teams that are strategically located throughout the United States. Have Storm or Flood Damage? Call Us Today at 859-225-3193. Last week this local commercial building suffered a large water loss. In this particular instance, our SERVPRO team was called after hours to respond to the unpleasant surprise for the local building. Our SERVPRO team responds day and night and is always "faster to any disaster". The first night our SERVPRO team responded, the water level was higher than expected. But in just a few short hours our SERVPRO team had the water drained and were beginning to clean the area. After the water was drained, they could begin the drying process. Luckily, our team has all of the necessary equipment and we were out of there in just a few days! 4/10/2019 - Do you need Commercial or Residential Demolition? 3/8/2019 - Our marketers love to network! 3/1/2019 - We are Hosting C.E. Classes! 2/5/2019 - SERVPRO helping out the Wildcats! 2/5/2019 - When Storms or Floods hit, SERVPRO is here!